As indicated in the introductory page, foraminifera are separated into the planktonic and the benthic foraminifera on the basis of their life strategy. Planktonic foraminifera are represented by many species with worldwide occurrence in broad latitudinal and temperature belts, floating in the surface or near-surface waters of the open ocean as part of the marine zooplankton. Benthic foraminifera are as successful as the planktonic foraminifera group and even more abundant in modern seas and can live attached or free, at all depths. Benthic foraminifera include two major types of foraminifera. The small benthic foraminifera, which have simple internal structures, and the larger benthic foraminifera, which have complicated internal structures and occur abundantly in the shelf regions of most tropical and subtropical shallow marine, carbonate-rich environments (Boudagher-Fadel and Price, 2013). The larger benthic foraminifera are not necessarily morphologically bigger than small benthic foraminifera, although many are, but they are uniquely characterized by having internally complicated tests. While one can identify small benthic foraminifera from their external morphology, one must study thin sections to identify larger benthic foraminifera from their internal test architecture. Larger benthic foraminifera develop complicated endoskeletons, which are reproduced precisely with each successive generation. These internal structures permit the taxa of such microfossils to be accurately identified, even when they are randomly thin-sectioned. All larger benthic foraminifera (LBF) are marine and neritic and live in oligotrophic reef and carbonate shoal environments (BouDagher-Fadel, 2008). Living forams occupy low-latitude areas and are most prolific in nutrient-deficient, warm, shallow seas. They are key in the production of carbonate sediment and are most often associated with coralgal reefs (BouDagher-Fadel, 2008). Past research in Palau by Hallock (1981) involving selected members of the rotaliine families indicated that carbonate production on seaward reef flats was approximately 1 millimeter per year. On lagoonal reef slopes deposition of approximately 0.2 mm per year was noted. Hawaiian seaward reef slopes showed a lower depositional rate (0.05 mm/yr) due to slower growth rates and the absence of the family Calcarinidae. The research indicated, overall, that production rates of calcium carbonate by selected foraminiferal familes were comparable to production rates shown for coral, coralline algae and macrobenthos (Hallock, 1981). The fossil record indicates that a similar distribution of foraminifera seen today was prevalent during the Mesozoic and Cenozoic. Sea temperatures over the last 65 million years can be approximated by living foraminifera (McMillan, 2000). In living forams, the minimum temperature tolerated is 18 degrees (Celcius) and the maximum water depth tolerated is 35 meters (Murray, 1973; BouDagher-Fadel, 2008). As a rule, the presence of larger benthic forams in the fossil record indicates a warm environment and the absence of them indicates a cooler environment. Although living distribution patterns of the symbiont-bearing larger foraminifera are confined to tropical and subtropical shallow marine environments, their distribution is determined by a complex set of inter-related parameters such as temperature, nutrient levels and light. 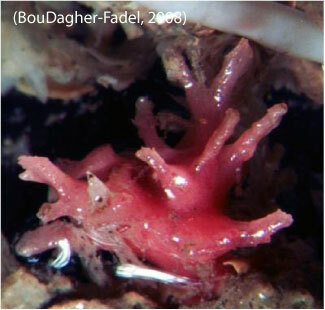 Water depth, as a secondary factor, is another parameter that affects indirectly the distribution of larger benthic foraminifera (BouDagher-Fadel, 2008). Light intensity, temperature and hydrodynmaic energy decrease with depth. Some larger foraminifera (amphistegina) become flatter, with thinner outer walls, with increasing water depth and decreasing light. Imperforate foraminifera (miliolines) are restricted to shallower depths than perforate forms, however, both forms house symbionts and the dependence on light for their symbionts limits their distribution to the photic zone. The depth distribution of living LBF taxa is related to the light wavelengths required by their symbionts and this has led many authors to use calcareous algae and larger foraminifera assemblages as proxy water-depth indicators in carbonate sediments (BouDagher-Fadel, 2008). Renema (2005) has found that diameter-thickness (D/T) ratio of larger benthic foraminifera varies inversely with depth. The near-shore samples have a higher D/T than the offshore species. Vagile (mobile) foraminifera are free to move along the sea floor and/or in its substrate. To the left is an SEM image of Ammobacculites. Sessile foraminifera are permanently attached or fixed (not free-moving). To the left is an image of Miniacina. Since the Carboniferous, larger foraminifera have thrived in shallow warm marine environments and their remarkable abundance and diversity is due largely to their ability to grow to a variety of sizes, their ability to exploit a range of ecological niches and their ability to transform their shells into greenhouses for symbionts (BouDagher-Fadel, 2008). For this reason, larger foraminifera show a tendency to suffer periodic major extinctions. This makes them valuable biostratigraphic zone fossils and provides insight into the general process of biological evolution. Like all fossils, larger benthic foraminifera are biofacies bound (sometimes regionally constrained). Feeding mechanisms and reproductive strategies are key traits that affect survival rates and it has been noted that small primitive forms fare better than large forms during times of stress (ecological change). The smaller forms can adapt more easily when a new environment is formed, which is one of reduced productivity. Then, as the environment stabilizes, larger forms develop and are established. Evolutionary trends, often following parallel lines of evolution have been researched in the past (cf. van der Vlerk, 1922; Tan Sin Kok, 1932; Haynes, 1981). The larger forams always preserve the juvenile stage before growing into an adult stage and increasing the size of their test and embryont. An increase in the number of chambers (or division of existing chambers) follows (BouDagher-Fadel, 2008). It is not uncommon to see identical shapes or structures appear again and again within the same lineage during evolutionary history. A good example of this type of convergency is the fusiform test, pictured to the left, which appeared at different times in different lineages. Morphological features, shapes and sizes of the foram is controlled onto only by genes, but by environment, ontogeny and conditions during growth. 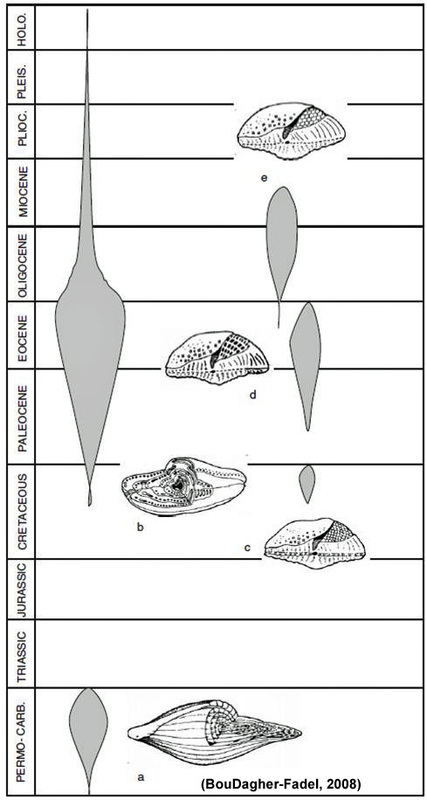 The convergence of similar shapes of test, but with different internal structures, shown by the fusiform test in (a) the calcareous granular fusulinines and (b) the porcelaneious alveolinids or the rotaliines, which have the same shape and internal three layered structures but different shape of embryonic aaratus and shape of chamberlets, in forms such as (c) the orbitoids, (d) the discocyclinids and the (e) lepidocyclinids. Interestingly, larger foraminifera, for instance Euleidina and Discocyclina, achieve their large sizes early in their evolutionary history. If a form reaches its optimum size it may not exhibit any more changes for millions of years barring any significant environmental change. There are key parameters that come into play when establishing morphological trends. This includes a complicated system of stolons layered laterally which allows the cytoplasm to extrude from these apertures, allowing construction of small chamberlets. Per Boudagher-Fadel (2008), larger forams represent one of the best examples of how genetic mutation allows a wide range of stable environmental niches to be occupied by acquiring alveoles, chamberlets and systems of stolons and pillars which likely resulted from gene mutation. This section provides an overview of the major evolution and extinction events and their timing. Please see the following sub-sections, or the original papers by BouDagher-Fadel (2008) for more detail on key foraminiferal groups that existed during specific geological times. Global (eustatic) changes in sea level and climate change are typically leverage to explain past extinction events, however, volcanic eruptions, anoxia, and meteorite impacts are also factored in. The study of forams provides insight into these global changes/extinction events. The first larger foraminifera evolved from the agglutinated foraminifera during the Carboniferous. These forams developed complicated internal structures and compound walls and are known today as the Fusulinina. They were ecologically dominant in the Late paleozoic but went extinct as a result of the Permian-Triassic crisis. During the Triassic, larger foraminifera evolved very slowly as it was a period of recovery. Forms included miliolines and later involutinines, however, at the end of the Triassic, another crisis occurred and wiped out most of the LBF that had formed during the recovery period. The Early Jurassic saw the evolution of agglutinated forms (textulariines) and some of the robust forms survived the transition into the Cretaceous. The inner carbonate platform environments along the Cretaceous Tethys were populated by large agglutinated foraminifera with complicated structures (alveoles, partitions, pillars) and the lituolids dominated. During the Middle Cretaceous, the alveolinids proliferated in mid-latitudes and they resembled the planispiral-fusiform fusulinines of the Permian. Simple rotaliines evolved during the Late Cretaceous into complicated three-layered textures (orbitoids), which were local to the Caribbean. Another extinction (KT boundary) killed off most of the LBF and it was not until the Late Paleocene that larger forams were seen. These included miliolines, nummulitids and orthophragmidds. Biogeographical provincialism was noted in the middle Miocene, perhaps due to fluctuations in climate or currents and most Miocene superfamilies are still extant. Miogypsinids and lepidocyclinids became widespread (world wide) and the closure of the Tethys re-established provincialism. Lepidocyclininds and miogypsinids were wiped out from America while deep-water textulariines appeared in America and a new genera of alveolinids appeared in the Indo-Pacific, which became a separate province after the closing of the Tethys. Neogene sequences of this area are dominated by warm shallow carbonates and are of utmost importance to hydrocarbon reservoirs. These large benthic forams play a large role in determining biostratigraphical stages and zonation for hydrocarbon exploration. While individual pages discuss individual foraminifera, their Superfamiles, familes, and selected genera, the Paleoecologic and Paleogeographic summary page gives a general description of where foraminifera existed and thrived and their habitat. BouDagher-Fadel, M.K., 2008. Evolution and Geological Significance of Larger Benthic Foraminifera. Developments in Paleontology and stratigraphy, v. 21, 540p. BouDagher-Fadel, M.K. and Price, G.D., 2010. Evolution and Paleogeographic distribution of the Lepidocyclininds. Jrnl Foram Res., v. 41, 1, 79-108. Haynes, J.R., 1981. Foraminifera. MacMillan, London, 433p. Murray, J.W., 1973. Distribution and Ecology of Living Benthic Foraminiferids. Heinemann, London, 274p. Renema, W., 2005. The genus Planorbulinella (Foraminiferida) in Indonesia. Scripta Geol. 129, 137–143. Tan Sin Hok, 1932. On the genus Cycloclypeus, Pt. 1, and an appendix on the heterostegines of Tjimanggoe, S. Bantam, Java. Wetenschappelijke Mededeelingen van de Dienst van de Mijnbouw in Nederlandsch-Oost-Indie¨ 19, 1–194. van der Vlerk, I.M., 1922. Studie¨n over nummulinidae en alveolinidae. Haar voorkomen op Soembawa en haar betekenis voor de geologie van oost-Azie¨ en Australie¨ . Wetenschappelijke Mededeelingen van de Dienst van de Mijnbouw in Nederlandsch-Oost-Indie 6, 329–468.